West Ham ensured their Premier League safety as they ended a run of four successive defeats with a comfortable win over 10-man Tottenham. Spurs had Younes Kaboul sent off for a foul on Stewart Downing before the hosts took the lead when Andy Carroll's header went in off Harry Kane. Downing extended the Hammers' lead with a low 20-yard free-kick. 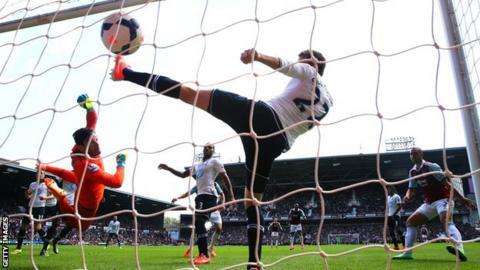 Spurs keeper Hugo Lloris kept the score down as the dominant Hammers eased the pressure on manager Sam Allardyce. The West Ham fans have voiced their displeasure at Allardyce's style of play and their team's results, but Upton Park was joyful following a third win over Spurs this season. Carroll's aerial prowess was a key element of his side's victory, while the visitors did not help themselves with some questionable defending. And the defeat will not have boosted Tim Sherwood's hopes of keeping his job at White Hart Lane, though the club this week denied claims they had enquired about Ajax coach Frank de Boer's availability. A top-four place was out of the visiting side's reach before kick-off, and they are still not assured of a Europa League spot with Manchester United able to overhaul them. "There was a time you thought West Ham's season would not end like this, with the home crowd on their feet giving Sam Allardyce's team a generous round of applause. A disappointing day for Spurs, who never recovered from the sending-off of Younes Kaboul." But they started promisingly as a well-worked counter-attack involving Kane, Gylfi Sigurdsson and Christian Eriksen ended with Emmanuel Adebayor's first-time shot being saved by Adrian. However, the home side were causing problems of their own as they had a penalty appeal for a Michael Dawson handball turned down before a mis-hit Guy Demel shot looped onto the Spurs crossbar. And the balance tipped firmly in West Ham's favour on 24 minutes, when the visitors were reduced to 10 men. Downing was racing clean through on goal when he was tripped just outside the area by Kaboul, who was sent off by referee Phil Dowd. From the resulting free-kick, Lloris pulled off a stunning save to palm Carroll's ferocious strike wide, conceding the corner from which the home side scored. Carroll's header at the far post went in off the head of Kane, who was immediately replaced by central defender Vlad Chiriches. If Sherwood was unhappy with the first of the hosts' goals, he will have been even more annoyed by the second. After midfielder Mark Noble was fouled on the edge of the area, Downing's free-kick went through the Spurs wall and into the bottom corner. And only Lloris prevented Spurs from suffering a heavier defeat. The France international kept out a Mohamed Diame overhead kick before thwarting Kevin Nolan at close range after the midfielder latched onto Carroll's flick-on. Tottenham took until stoppage time to significantly trouble Adrian, who excellently tipped over a Danny Rose strike. "I think the referee got the red card decision right. Younes was doing his best to get back at the attacker and I'm not sure Michael Dawson got round enough to prevent the red card. "It was a spirited performance from the boys in the second half. We had a few chances and if we had taken one of them it could have been an edgy finish. "He (Lloris) is so consistent with his performances. No matter what is going on around him he seems to just worry about his game and he is top class." Match ends, West Ham United 2, Tottenham Hotspur 0. Second Half ends, West Ham United 2, Tottenham Hotspur 0. Foul by Emmanuel Adebayor (Tottenham Hotspur). Corner, Tottenham Hotspur. Conceded by Matthew Taylor. Attempt blocked. Sandro (Tottenham Hotspur) right footed shot from outside the box is blocked. Corner, Tottenham Hotspur. Conceded by Adrián. Attempt saved. Danny Rose (Tottenham Hotspur) right footed shot from the centre of the box is saved in the top right corner. Attempt missed. Sandro (Tottenham Hotspur) right footed shot from outside the box is too high. Attempt blocked. Sandro (Tottenham Hotspur) right footed shot from the right side of the box is blocked. Substitution, West Ham United. Carlton Cole replaces Andy Carroll. Sandro (Tottenham Hotspur) is shown the yellow card for a bad foul. Foul by Sandro (Tottenham Hotspur). Attempt saved. Andy Carroll (West Ham United) header from the centre of the box is saved in the top centre of the goal. Assisted by Stewart Downing with a cross. Attempt blocked. Stewart Downing (West Ham United) right footed shot from outside the box is blocked. Attempt blocked. Andy Carroll (West Ham United) right footed shot from the centre of the box is blocked. Mohamed Diamé (West Ham United) wins a free kick on the left wing. Attempt blocked. Roberto Soldado (Tottenham Hotspur) right footed shot from a difficult angle on the right is blocked. Assisted by Christian Eriksen. Kyle Naughton (Tottenham Hotspur) wins a free kick in the defensive half. Attempt missed. Aaron Lennon (Tottenham Hotspur) right footed shot from outside the box misses to the left. Assisted by Christian Eriksen. Attempt missed. Roberto Soldado (Tottenham Hotspur) right footed shot from the right side of the box misses to the left. Assisted by Christian Eriksen. Attempt missed. Andy Carroll (West Ham United) left footed shot from outside the box misses to the right. Roberto Soldado (Tottenham Hotspur) is shown the yellow card. Guy Demel (West Ham United) wins a free kick on the right wing. Attempt missed. Andy Carroll (West Ham United) header from the centre of the box misses to the right. Assisted by Stewart Downing with a cross following a corner. Corner, West Ham United. Conceded by Vlad Chiriches.